Shiny Vikavolt in game: 30 Who? Important notice! 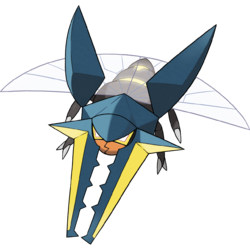 Pokemon Shiny Vikavolt is a fictional character of humans. Vikavolt (Japanese: ????? Kuwaganon) is a dual-type Bug/Electric Pokémon introduced in Generation VII. 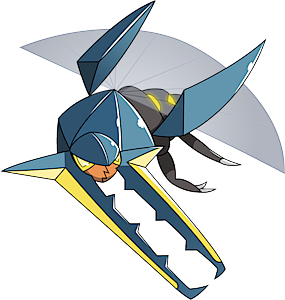 Vikavolt is a beetle-like Pokémon with a large pair of mandibles. Its small orange face has robotic, yellow eyes and is covered by a blue carapace. The mandibles extend from this helmet. They are blue on the inner surface and yellow on the outer surface. At the base of each mandible is a large spike and the inside is lined with short spikes. Its body is black and divided into three sections by yellow rings. The last two sections have a yellow spot on each side. On its back is a pair of wide, flat wings that are transparent with blue wing covers. It has four legs. The front pair of legs has two claws, while the back pair has only one. Vikavolt produces electricity with an organ in its abdomen, and controlled by its huge jaws to fire beams. When it clasps a Charjabug in its legs, it is able to utilize it as an extra battery. This allows it to continue firing powerful attacks. However, in fierce aerial fights, it will release Charjabug to make itself lighter and more mobile. It is an adept flier, capable of acrobatic maneuvers such as tailspins and sharp turns. Even as it weaves through complicated tangles of branches in the forest, it is able to maintain high-speed flight. It is known to have a rivalry with Pinsir. Kuwaganon may be a combination of ??? kuwagatamushi (stag beetle) and cannon.